In TVB for over 15 years, Selena Li (李施嬅) starred in numerous dramas but she has never won an award in Hong Kong. However, the I Bet Your Pardon <荷里活有個大老千> star’s talent and hard work has been recognized overseas. Last year, she won two awards in the United States. the new year brought good news of Selena getting a nomination in a prestigious Canadian awards. In 2017, through the Hollywood short film Once More, Selena won the “European Cinematography Awards” and “Los Angeles Film Awards” Best Actress awards. 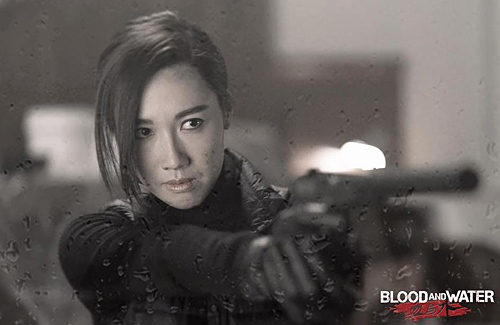 This year, she has been nominated for Best Supporting Actress for her performance in Canadian television crime drama, Blood and Water <血與水>, in which she plays an assassin for the “2019 Canadian Screen Awards”. This year, Selena will be starring in TVB’s Forensic Heroes 4 <法證先鋒IV>, and she hopes that this drama will be successful. the show seems to have a western style crime genre feel to it from the preview. is it just in canada or is it a new trend that they are casting asian leads in series. i knew about fresh off the boat b/c they made a big deal about it, but this is the first i heard of this. it’s weird how it’s canadian but half the dialog is in cantonese/mandarin. Congrats to her! I really liked her in Succession War and wish she got some recognition for that role. Alas, the series had poor ratings and no buzz. I will have to check out this show. LOL! I’m laughing while I am watching the trailer. The quality of acting and the dialogue exchanged in multiple languages makes it looks so awkward! Which leads me to believe her award is as much of a joke as this show. Lol! Moreover, there’s nothing prestigious about the Canadian Screen Awards because Canadian films are garbage. Most Canadians don’t even watch Canadian shows. The only reason why Canadian films exist is because it is subsidized by Canadian taxpayers. Canadian films without public subsidy won’t even stay afloat. LOL! I am in Canada btw. Lol! @anon lol, my thoughts exactly. Winning a Canadian acting award is probably even below winning a TVB award. We Canadians don’t even watch Canadian shows, and it’s pretty much force fed to us though thr CBC. I happened to watch 2 hours worth of this series and the dialogue is seriously not good with some unintentional laughable moments. There are actually 2 actors of actual consequence in this entire thing: Selena and Byron Mann. Safe to say, I have not continued watching. Keep it up Selina! I believe you will do well one day. You have improved and you deserve a good script.